New Adventures of one of the strangest heroes in Pulp Fiction History! This volume has four modern stories featuring the Purple Scar from the old pulps! The Purple Scar was published in Exciting Detective in the 1940’s. There were only four original tales featuring this bizarre hero. All of the stories bore the byline JohnS. Endicott, a house name for Thrilling Pulps. Who really penned the stories is a question for the experts. The first story, “Satan on the Stump” by Jim Beard tells the story of a man with ambition. SJ Endermann has been the dark horse in the local Governor’s Race. Now a gang hits one of Endermann’s fundraisers. The Purple Scar saves the day only to be blamed for the mess by Endermann himself! The story includes a guest star in Tony Quinn—AKA The Black Bat! Five Stars and “Best in Book!” from the Raven! Next we come to “Liquid Death” from writer Gene Moyers. Someone is stealing morphine shipments and is also robbing local pharmacies. 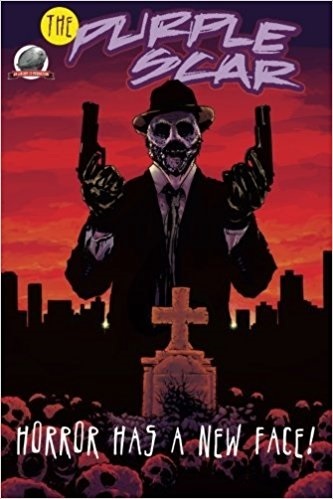 Last but not least, new pulp author Gary Lovisi presents “The Murder Syndicate.” People are being hunted down and murdered in broad daylight. A mysterious woman has been seen nearby after some of the crimes. Is she a beautiful hit-woman for hire? I think this one is very good! Five stars! And four stars for the book as a whole!